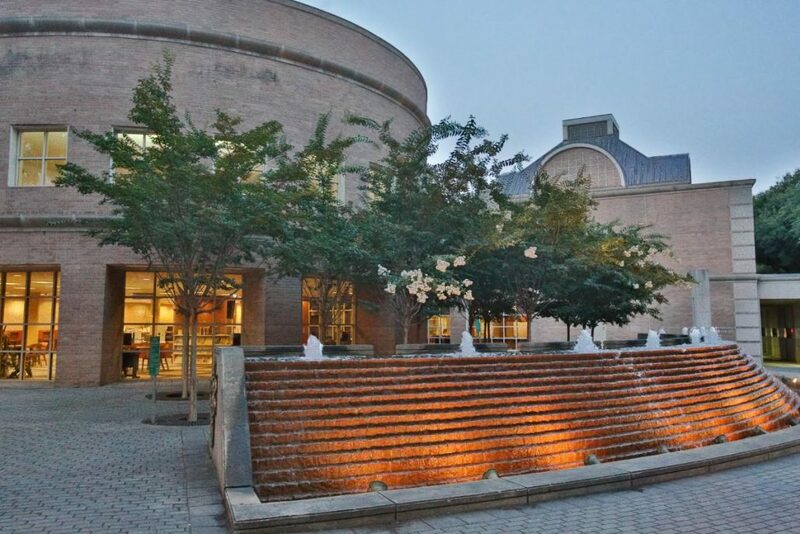 As part of Mecklenburg County’s Capital Improvement Program, the Main Library located in uptown Charlotte will be replaced and closed for several years. Early in the planning stages, Library and County officials recognized that the Library is an important component of an ecosystem that supports Charlotte’s homeless population, in direct alignment with its mission to improve lives and build a stronger community. They further identified that the needs of the homeless would need to be addressed in the space and programming for the new Main Library. To better understand those needs, Charlotte Mecklenburg Library and Mecklenburg County Community Support Services partnered to conduct a survey in September 2017. This survey was designed to understand the impact of the closing on library users and what resources, services and programs are most valued by individuals who use the Main Library every day.  The survey, developed with additional input from Urban Ministry Center and the Men’s Shelter of Charlotte, started on Monday, September 25 and lasted one week. Thirty-three volunteers from homeless services agencies as well as from the community completed 40 shifts, totaling 80 hours. Library staff provided the space and resources to conduct the survey, including tables, chairs, laptops and incentives for completing the survey. Volunteers were stationed in different locations throughout the Main Library campus with a laptop, bowl of candy, and coupons for free coffee. Anyone using the library was eligible to complete the survey. There were 149 total individuals who completed the survey of which 62% (93) were completed by individuals at risk of experiencing homelessness or currently experiencing homelessness. The information below refers to these 93 individuals. Forty percent of individuals had experienced homelessness for more than 7 months and slept in an unsheltered location the night before they took the survey. The majority were male (81%) and identified as Black or African American (59%). Most (91%) use the library for more than one hour and over half use at least one of the main services provided: computers, books, magazines, newspapers, bathrooms, wi-fi, or book clubs. Of all the services available, computers are the top reason they use Main Library. 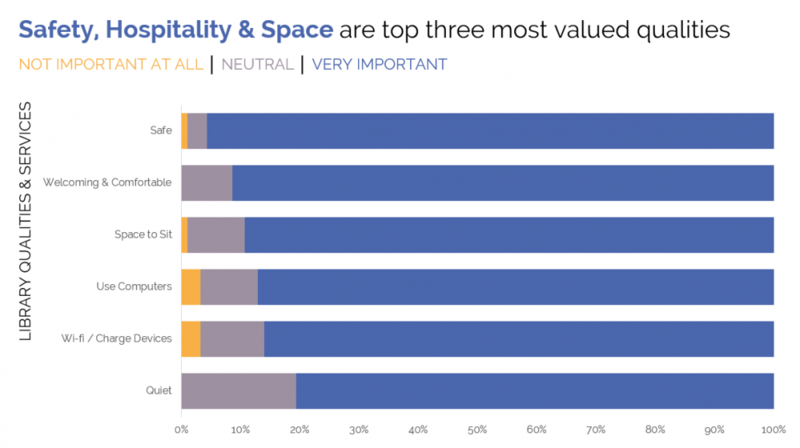 Safety, hospitality and space are considered the top three most valued qualities of the Main Library. In addition to those qualities, access to computers, wi-fi and charging stations, and the ability to sit in a quiet space were important. In the absence of a Main Library campus, respondents shared that they would try to access resources at other Library locations nearby including Plaza Midwood, Beatties Ford, Sugar Creek, ImaginOn and Scaleybark. Main Library currently provides a safe space where they feel comfortable to use bathrooms and rest indoors, especially when the weather is extremely hot or cold. When asked where they would go to access a public restroom, over 50% reported they would use other Uptown public and private locations for a restroom. Twenty-six percent (26%) shared they did not know of or did not have an alternative place to go if there is bad weather. 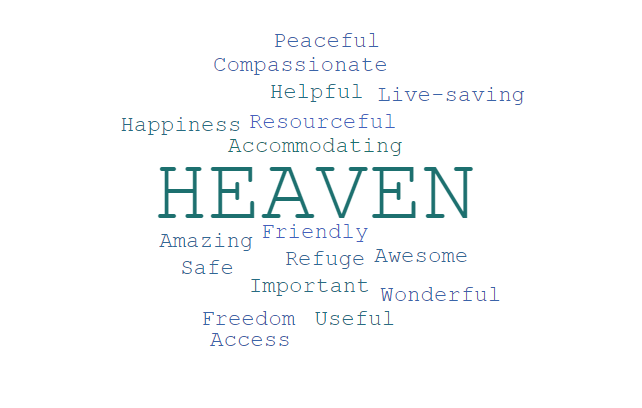 All respondents were asked to offer a word they would use to describe what the library means to them. The words when compiled together are a powerful reflection of what the library represents to some of the most vulnerable residents in our community and serve as a beacon to remind us what components should be part of an interim and future site. This project by Mecklenburg County Community Support Services and Charlotte Mecklenburg Library is a strong example of what is possible through collaboration, data and community engagement. Through the survey process, we learned that 24% of the individuals did not have a library card, but were likely eligible to receive one. This was helpful to understand ways the Library can immediately improve education about access to library resources. In addition, by integrating street outreach and emergency shelter staff into the planning and implementation of the Main Library renovation project, we created a stronger process and survey product while also connecting staff and with individuals who wanted follow-up services. This led to additional conversations about integrating the work of outreach staff and library staff to strengthen both groups and provide better services to patrons. Planners are currently incorporating the results of this survey into the interim and final plans for the Main Library campus. For additional information, and to sign up for Main Library updates, please visit www.cmlibrary.org/mainlibraryfuture.  Mecklenburg County Community Support Services is a department in Mecklenburg County’s Health and Human Services Agency, which transforms lives and community by supporting veterans, ending homelessness, treating substance use, and preventing and intervening in community and domestic violence. Charlotte Mecklenburg Library is one of America’s leading urban public libraries, serving a community of more than one million citizens in Mecklenburg County, North Carolina. On average, the Main Library door count averages between 13,000 and 14,000 visitors per month.